Seaplane Training can be one of the most relaxing, fun events in your flying activities. It can normally be completed in 5-10 hours of training, depending on your skill level and the flight school or instructor. It will also comply with the requirements for the Biennial Flight Review (BFR). There are no minimum number of hours required, nor a formal FAA written exam. There is a Oral/Practical Flight Exam with a Designated Pilot Examiner. Click here for training information from the Seaplane Pilots Association. Here's a list of books for the student seaplane pilot from SPA. Lakeshore Aviation, a FBO located in Manitowoc, WI (just 35NM east of OSH) operates the only full-time seaplane school in Wisconsin! 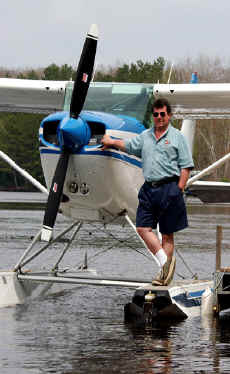 For more information about seaplane training in the Midwest, contact Curt Drumm, CFI. Or call Lakeshore Aviation at 920-682-0043.